May 1, 2013- Rochester, NY – Last fall, Semrock opened the door on a new high-capacity manufacturing facility for industry-leading optical filter products. 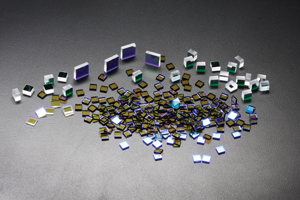 Having entered full-scale production, Semrock now supports the needs of its OEM customers by producing 10,000s of spectrally complex, hard-coated sputtered optical filters with high-volume pricing. By building on its renowned filter manufacturing capability, Semrock can now extend the same quality and reliability that our customers expect to opportunities in the emerging diagnostic and point-of-care (POC) healthcare, and display and sensing markets where high-performance, miniaturized optical filters are an enabling technology. • In volumes up to 10,000s, depending on the desired need. Due to improvements inherent coating process used, it is now possible to offer optical filters up to 8” diameter. All filters produced in this new facility are manufactured with proprietary optical monitoring to ensure the highest standards in batch-to-batch reproducibility and performance reliability for which Semrock is known and trusted. Semrock is ITAR compliant and provides its customers with guaranteed product performance, on-time delivery, service responsiveness, and collaborative solutions from its expert team. If you would like to discuss your upcoming large volume project, please call Neil Anderson, PhD, Manager, Strategy and Business Development at 585-594-7000 or email. For more information, please watch our video. Semrock, Inc., a Unit of IDEX Corporation’s Optics & Photonics platform, manufactures in high-volume, optical filters that set the standard in performance and reliability for the biotech and analytical instrumentation industries, as well as innovative optical filters for more general laser and optical systems applications. All Semrock optical filters are made with hard ion-beam-sputtered optical coatings. OEM filters are manufactured in volume. End-users benefit from a wide selection of standard catalog products that ship from stock. Semrock’s patented and patent-pending products include its highly acclaimed BrightLine® fluorescence filters, state-of-the-art filters for Raman spectroscopy, and other unique filters for lasers and optical systems. Semrock’s innovative products, made possible by combining modern sputtered coating techniques with Semrock’s proprietary volume manufacturing technology, are covered under a five-year warranty.